How to create a Lesson using the Conversation with three Participants Type? You can use the Conversations component to create Conversation with three Participants type. In this type of conversation, there are two questioners and one answerer. You can present some important topics in your lessons as conversations using this component. The user can see the questioners’ image and two initial questions at the left side of the page. For each selection, the user can see the questioners’ responses. Type the name of the first questioner on the First Questioner's Name field as shown in the above image. You can also change the format of the name. 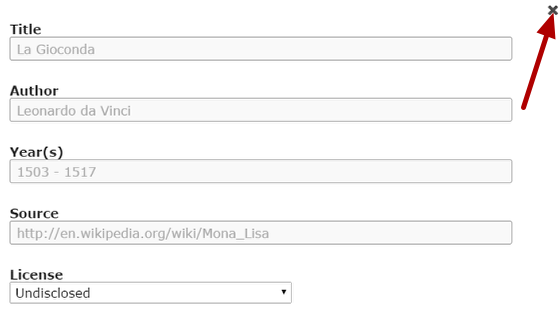 This field is not mandatory, and if you don't enter a name, it won't be shown as an empty space on the page. Type the name of the second questioner on the Second Questioner's Name field as shown in the above image. You can also change the format of the name. This field is not mandatory, and if you don't enter a name, it won't be shown as an empty space on the page. 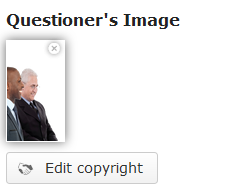 You can add the questioners' image for the conversation by clicking the '+' icon under the Questioner's Image title as shown in the above image. You will choose an image file as shown in the below image. 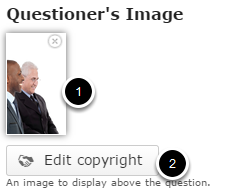 Similarly, you can add an image for the answerer under the Answerer's Image field and edit its copyright details. You can see an image for the answerer has been uploaded in the above picture. 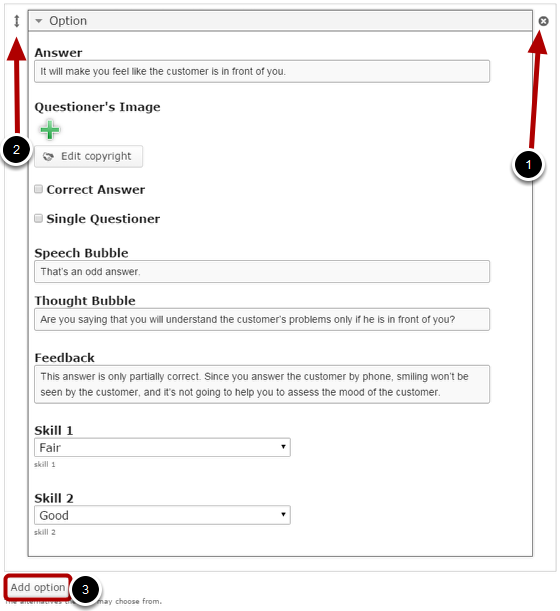 You can add text to the initial question field as shown in the above image. This text will become the second questioner’s question. Just type the text in the Initial Question field as shown in the above image. You can also change the format of the text, add and remove hyperlinks and insert horizontal lines between the contents. This text will become the first questioner’s question and it won’t appear as a thought bubble. Just type the text in the Initial Thought field as shown in the above image. You can also change the format of the text, add and remove hyperlinks and insert horizontal lines between the contents. Make sure you uncheck the Single Questioner checkbox, because, it is necessary to uncheck it to have the initial questions appear appropriately. If you check this checkbox, the second question will appear as a thought bubble. If you click the Modal Screen  checkbox, some text in a modal screen will appear at the beginning of the conversation. You can place some introduction or instruction texts on the modal screen. Under Available Answers title, we can add the answer options the user can choose from. Four empty available answers are listed by default. 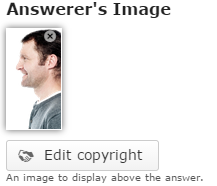 Start entering the answers in the Answer field as shown in the above image. You can also change the format of the text, add and remove hyperlinks and insert horizontal lines between the contents. Since we are creating a conversation with three participants, we need to uncheck the Single Questioner checkbox as shown above. This text will become the response from the second questioner. 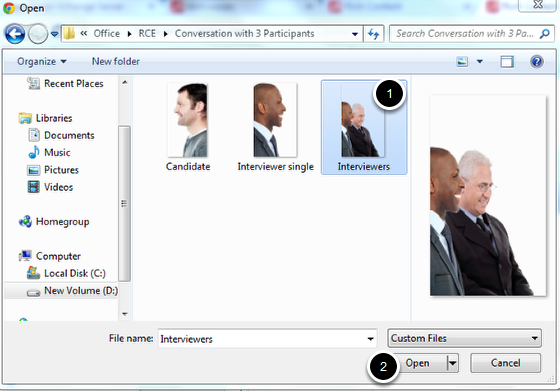 Just type the contents in the Speech Bubble field as shown in the above image. You can also change the format of the text, add and remove hyperlinks and insert horizontal lines between the contents. This text will become the response from the first questioner. Just type the contents in the Thought Bubble field as shown in the above image. You can also change the format of the text, add and remove hyperlinks and insert horizontal lines between the contents. After selecting the answer, the user can see the ratings for the skills in two scales depending on the response selected. By default, the skill is set to Poor. You can see the finished page created with “Conversation with three Participants” type as shown in the above image. You can upload images in .jpg, .png and .gif formats only. 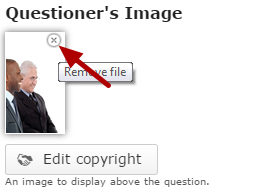 You can change any answer to show response only from one questioner by clicking the Single Questioner checkbox and by uploading an image showing only one questioner. Make sure that you give the correct text for the thought bubble. If you’ve added text for the modal window and failed to check the Modal Screen checkbox, the modal window won’t appear. So, make sure that you check this checkbox if you want to add modal screen.